07 | March | 2011 | WHAT A FEELING! That’s about the size of it. In Oliver Stone’s morality play, this hungry kid sins by becoming the Faust of the stock exchange, selling his soul to a devil/madman/genius who controls half the money in New York City (and this the relevant world). Stone has mapped out the struggle of good and evil before, most impressively in his battle-zone dramas, Platoon and Salvador. This time he’s indoors, but these soldiers still talk about making a killing, and they even wear uniforms—the suspenders and yellow power ties of the Wall Street infantry. Bud manages to make a modest killing by using an inside tip. Gekko rewards him with a visit from a paid companion and a lunch of (appropriately) raw meat. It isn’t long before the rest of Bud’s life is looking up; Gekko’s former mistress (Daryl Hannah) is now installed as a girlfriend, and Bud musters enough for the down payment on a million-dollar Upper East Side condo, complete with appalling modernist design. At some point Bud begins to get the idea that his illegal procurement of inside information, including dressing up in a janitor’s outfit to sneak into lawyers’ offices, is going to catch up with him. And even that it may be wrong. Hollywood folks have been wondering whether this bull-market movie might have lost some of its relevancy, in the wake of the big crash. I suspect not. Presumably the same cutthroats are safely in place in the real Wall Street, despite Black Monday; there weren’t that many brokers jumping out of windows. And greed knows no off-season anyway. 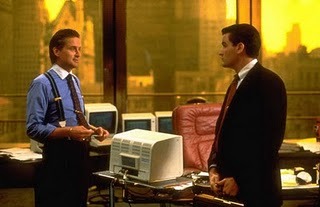 Besides, Wall Street would be an enjoyably entertaining movie anytime. Stone occasionally allows large philosophical observations to drift into his characters’ mouths, and the movie’s a bit too long for its flimsy weight. But most of the dialogue, by Stone and Stanley Weiser, is crackling, and spoken by a colorful cast. Sheen, who also played the central role in Platoon, is fine as the callow trader. His father, Martin Sheen, plays his father here, the film’s voice of blue-collar reason, who can’t brook his son’s strange insider language and $400 suits. Stone has made the movie as an ethical lesson, and he tries to demonstrate that all those dollars that have been flying merrily around for years may actually be connected to ordinary peoples’ lives. Actually, I suspect that the thing audiences may remember about this movie is how much fun it is to be in the limo and the Lear jet. That may not be what Stone intended, but it’s certainly the spirit that made Wall Street what it is today. That last paragraph turned out to be true, to the point that the real-life buccaneers of the early 21st century made their role model Gekko look like a piker, an idea Stone got some play out of in the Wall Street sequel. Some young actors involved with the film might have drawn some unintended lessons from it too; give Stone credit for spotting the buzzing grandiosity inside Charlie Sheen, which has lately been on such prominent display. The movie’s overstated in the manner of High Stone, a style that manages to seethe with a certain jangly energy even when it makes you want to slap your head. The sequel did not catch the old crazy fire, possibly because fiction had been embarrassed by reality at that point. You are currently browsing the WHAT A FEELING! blog archives for the day Monday, March 7th, 2011.